Yeasts, sugars, microscopes and a plenty of books? Why do scientists need all those things? Little researchers discover the Max-Planck-Institute. 06.10, 06.50, 07.30 and 08.15 p.m.
On a guided tour with our scientists and librarians kids will discover different places of the Max-Planck-Institute. Experience what researchers look up at the library and perform experiments with our scientists. Register at 6.00 p.m. at the meeting point "Kinderführung" in the ground floor. Each tour lasting about 30 minutes, for children aged 6 to 10 (preferably in German). 6.00 p.m. to 0.00 a.m., Big Seminar Room "Prigogine"
… for example water, urea, methane or formic acid? The chemists and engineers of the Max-Planck-Institute Magdeburg will show you how. Waste separation, using recycling paper, going by bike instead of a car or producing honey on your own. 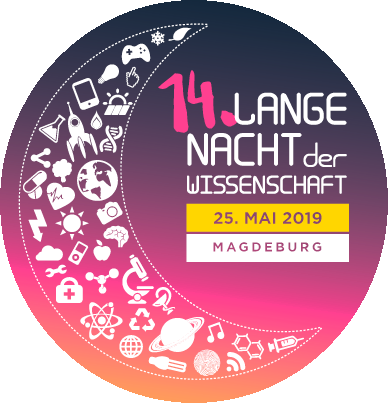 All those things you may already know from your school or kindergarten are similarily important for scientists day to day and are applied by the Sustainability Group of the Max Planck Institute Magdeburg. Delivering medications into proteins - Cromprehend the structure and functions of proteins. How do we use modern mathematical methods to regulate and simulate complex machines? Find out, how our engineers design efficient chemical processes! How can vaccines be produced faster to respond to new emerging diseases? Functions and structures of glycomics - can they be shaped? ...Gaining a better understanding of microorganisms and tailor-made optimization. Around half a million people die of malaria every year. The production process of the best therapy agent so far, called artemisinin is optimized by engineers of the Max-Planck-Institute. This is the only way to produce it affordably for patients (commonly from developing countries). The isolation of mirror image pharmaceutical agents is also researched via different methods at the Max-Planck-Institute. You will get to know the different procedures at our "Technikum." At hands-on experiments, you can let crystals grow and unravel colour mixtures. Visit our pilot scale lab, also in English language. Please register at the meeting point "Technikum" at the entrance to the pilot scale lab. How to produce an affordable remedy for malaria and how to isolate mirror image agents? How to produce colours, pharmaceuticals and detergents in a sustainable manner? How does our Weather Affect the Growth and Composition of Microalgae? Green microalgae are real all-rounders, but their free-range growth is heavily dependent on the weather. Take a look at our algae breeding facility in action! From renewable hydrogen to methane in less than 10 minutes, how does it work? Methanation - from renewable hydrogen to methan in less than 10 minutes, how does it work? Last revised: April 8th, 2019, Subject to updates and alterations.